Real estate packed with fun, the Emerson Cubby House from HipKids! For young children, never is there a greater toy in the back yard than a cubby house. Adventure awaits with the Aussie made Emerson Cubby, packing four brilliantly fun outdoor toys into one fabulous looking cubby! From the awesome crew at HipKids, the Emerson Cubby House is perfect for keeping kids active and enjoying the great outdoors with a huge plastic slide, climbing wall and sand pit all included. Boasting a gorgeous weatherboard look complete with perspex windows, a deck, a door and a sweet gable window, this lofty, durable cubby house is set to be the jewel in your backyard crown. Emerson is sold unpainted, leaving it for you and the kids to paint any colour your heart desires – fun! 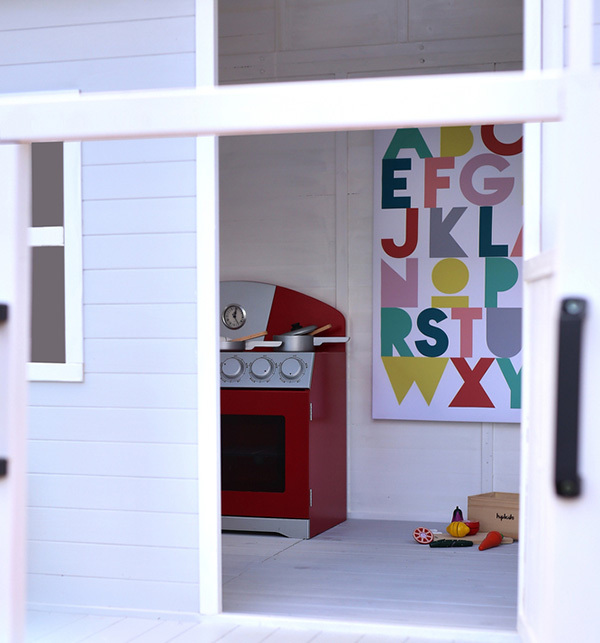 A brilliant backyard toy to enjoy all year round, you’ll also find all manner of quality toy kitchens and pretend food to kit it out with at HipKids. The Emerson Cubby is priced $1699 and available direct from HipKids.